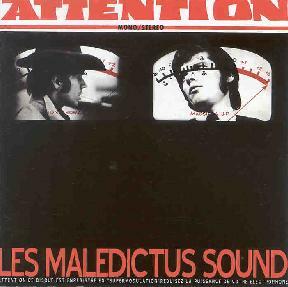 The Maledictus Sound - "s/t"
I'd never heard of this album before, but The Maledictus Sound was first released in 1968, and I would have loved to have seen the looks on the faces of those who heard it. I believe it was recorded in France, though the Mucho Gusto label that has reissued it is based in Quebec. I've always loved the groooooovy, sometimes campy, music heard in countless 1960's beach and party films, and The Maledictus Sound is just full of that kind of stuff, while venturing deeply into wild freakout territory. A terrific mish-mosh of styles and studio effects, this is a good fun album that I'll bet had a prominent place in the LP collections of the members of bands like Vas Deferens Organization. Tracks like the opener, "Kriminal Theme", feature the kind of psychedelic big band music that was so ubiquitous in 1960's films. There's lots of horns, but along with this are spaced out synths unlike anything I've heard from a 1968 recording. And the screaming voices on the track are absolutely insane. "Heathcliff Y Cry Your Name" is a freaky atmospheric tune with a nice organ sound, eerie synths, and more ultra strange voicings. "Inside My Brain" is an oddball tune with a Sonny & Cher "The Beat Goes On" bass, along with horns, and heavy rockin' psych guitar. For guitar I really love the screaming licks on "Crazy Circus". "Jim Clark Was Driving Recklessly" is a wild freak-fest that takes place on a racetrack. It rocks hard but the keyboard work is among the best on the album. And without question my favorite track is "Monster Cocktail". Stand back Bobby Boris Pickett. Your Crypt Kickers ain't got nothing on this tune. A heavily dosed take on the "Monster Mash", with a "They're Coming To Take Me Away Hah Hah" beat. FREAKY to the extreme! Along with all this are several novelty tunes, a couple of which include Alvin and the Chipmunks voices. There's also a couple light orchestral songs that I considered throwaways. The reissue also includes a nearly 9 minute bonus track, "L'etrange Monsieur Whinster", that's quite a bit different from the 2-3 tunes that make up the rest of the album. It alternates between complex progressive rock and lighter ethereal prog, and incorporates a range of ethnic influences. But the music can't sit still, continually changing directions as it journeys, in collage fashion, through an endless maze of musical styles. It's just as crazed as the album, but seems much more serious in its intent. Overall, a good fun set of freakiness from the late 60's. For more information you can email Mucho Gusto at: muchogustorecord@hotmail.com. Contact via snail mail c/o Mucho Gusto; C.P. 47613; Montreal, Canada; H2H 2S8.